The UN High Commissioner for Human Rights Zeid Ra’ad Al Hussein has expressed “strong concerns about the hasty and apparently unfair trial” of former President Mohamed Nasheed and called on the Maldives to enable international jurists to observe an appeal. The Criminal Court on March 13 found Nasheed guilty of using the military to “forcefully abduct” the court’s Chief Judge Abdulla Mohamed in January 2012. “It is hard to see how such hasty proceedings, which are far from the norm in the Maldives, can be compatible with the authorities’ obligations under international law to conduct a fair trial,” the UN Human Rights chief said. The UN Special Rapporteur on the Independence of Judges and Lawyers Gabriela Knaul in May 2013 described the Maldives judiciary as “a system in crisis,” and expressed shock at reports of political bias and concern over judges’ low qualifications. Zeid today noted the Maldivian Constitution affords anyone accused of a crime the right to adequate time and facilities to mount a defence. But Nasheed was without legal counsel at a February 23 remand hearing in which the Criminal Court ordered the former president be kept in detention until the trial ended. Moreover, when Nasheed’s lawyers quit in protest of the Criminal Court’s refusal to provide additional time, the three-judge panel did not wait until he had new counsel before proceeding with the trial, Zeid noted. “The government argues the new case against Nasheed was based in the same materials previously available to his legal team, but he should have been given time to instruct his counsel and prepare a new defence,” he said. The Criminal Court’s decision not to call defence witnesses was also “contrary to international fair trial standards,” he said. The High Commissioner for Human Rights also raised serious questions about conflict of interest over the judges and Prosecutor General having been witnesses during the 2012 investigation into Judge Abdulla’s arrest. PG Muhthaz Muhsin and Judges Abdul Bari Yoosuf and Abdulla Didi were present at the Chief Judge’s home at the time of his arrest, but the two judges refused to step down from the bench claiming there was no conflict of interest. 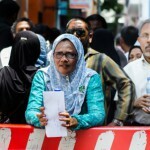 Zeid also noted the Human Rights Commission of the Maldives, and domestic as well as international observers were barred from monitoring the trial proceedings. He urged Nasheed be given adequate time to prepare and present his defence during the appeal process. “The Nasheed case places the Maldives judicial processes in a sharp spotlight. The flagrant irregularities in this case can still be rectified in the appeal process, and I urge the authorities to restore domestic and international confidence in the legal system by enabling international jurists to observe the appeal process,” he said. The Supreme Court introduced new appeal procedures in January reducing the time allowed to lodge an appeal from 90 working days to just ten. Although lawyers must file an appeal with ten days, the Criminal Court said it will take up to 14 days to provide a signed copy of court proceedings. Nasheed on his words in 2012 told that his initial charges lodged again him by how own PG is unfair for the crimes that he had committed. He himself told that PG should charge much more harsh and should be charged on account of abducting and hijacking the judge. Nasheed told that initial charge will be same as a person who drive a motor bike without light . But two incidence is not same. These are very words that Nasheed himself told in front of national TV which was live casted . But now UN is condemning the arrest of Nasheed and his charges. In 2012, even supreme court ordered to release the judge and yet Nasheed gave a deaf ear. If anyone want the proof, please watch DhiTV very evening, they show this video every night . The video was unedited and was speaking in our language and translation is showing at the bottom. The government had a believable and logical agurement against Nasheed for detaining Criminal Court Judge and prosecute him for his actions while president, however, what the government did by abruptly changing the charges to terrorism, appointing judges who were themselves witnesses in the case, and then detaining Nasheed during trial denying him of basic rights to defend his case and rush the verdict - were completely and totally unnecessary, specially given the fact government had absolute and unquestionable power over judiciary, parliament, executive, MNDF and the police to put up a well crafted show trial that atleast appeared fair and just in front of the eyes of the opposing masses and the international community. The reasons why government chose to go down this hasty path can only be attributed to factors beyond that go beyond logical reasoning and common sense. Reasons that are rooted in shear hatred and revenge seeking behaviour against Mohamed Nasheed for his very existence in politics and governance which the Gayooms believe is their birth right. Where were you the last year? When 500 children were slaughtered in Gazza. Does the UN support detaining and abducting judges. Its seems so. Fact is this is a political matter which cannot be addresses within UN rules. Ofourse, Nasheed's case is political. But Nasheed has also made a wrong calculation (or a mistake) for a politician. Even a brilliant goal keeper can make a mistake and loose the game and the tournament. And if FIFA is to pass verdict on such cases, God forbid. Precisely. The regime orchestrated the worst possible trial when ALL institution are under its effective control. The problem is not the fact that Nasheed is on trial. The problem is that there is no court of law in the Maldives that's capable of conducting a fair and free trial!